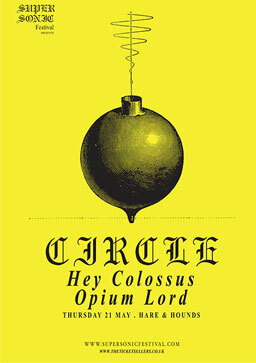 It’s just over three weeks until our pre-Supersonic Festival warm up show, featuring three mysterious musical outlaws; the one and only Circle, Hey Colossus and Opium Lord. Get your tickets here. Circle have constantly reinvented themselves, weaving hypnotic mantras out of exacting Krautrock beats, heavy riffs, arty noise, dark psychedelia, and soundtrack-like beauty. Emerging in a haze of demented riff science and booze-addled abandon, Hey Colossus have carved out a notable niche for themselves in the British underground’s murkier quarters. Desolate doom-sludge with a coal black heart, redefining what doom can be. Filthy grooves meet abrasive noise to convey a menacing atmosphere akin to the dodgiest drinking establishments that only a band from Birmingham could make.